Everybody Cheats Is Out Now! After eight months of solitude, I can finally say that Everybody Cheats is available in print and on Kindle! I would greatly appreciate it if you could help show your support and give the book a chance. Being a first time author, and not having the Kardashian status to promote my book, I am relying on my faithful followers and Facebook friends. Everybody Cheats is short, sweet, and to the point. It’s a modern, humorous and brutally honest look into our relationships. And it’s not just for women! Men like the book too! Just take a look at what my Editor had to say about Everybody Cheats. “This is one of the most interesting books I’ve read on relationships and cheating! Her insight is amazing and her advice seems like it’s spot-on to me. Anyone who reads this book will certainly get a better idea of what to do and what not to do! And she’s right on about the college experience. Some of the best times of our lives happen in those years!” -Editor Ken at FirstEditing.com. 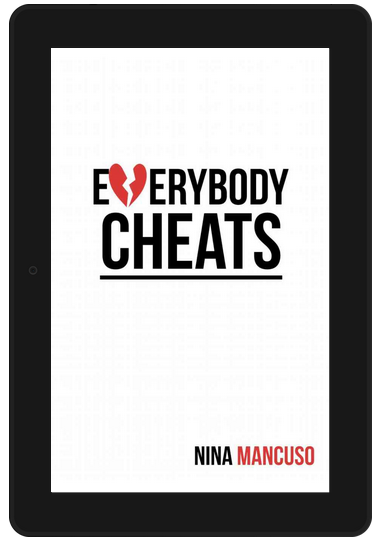 So if you’re looking for a quick and fun end of Summer read, please consider Everybody Cheats! Thank you all for your support! You all mean the world to me! Congratulations! I will check it out and I hope others do the same.